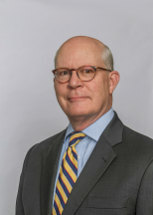 Chip Finn received his Bachelor of Arts degree from the University of Texas, Austin in 1978, his law degree from the University of Arkansas, Fayetteville in 1981, and his Masters in Tax Law from Washington University, St. Louis, Missouri, in 1985. His practice primarily involves general business and taxation matters (with an emphasis on business formation, acquisitions and related transactions), estate planning, probate and administration, and health law (with an emphasis on physician practitioners). Finn is past president of the Tax Section of the Knoxville Bar Association, and presently serves as a Board member of several non-profit corporations and advises several charitable foundations. He is admitted to both the State Bar of Tennessee and the State Bar of Arkansas. Finn presently serves as a Board Member of Interfaith Health Clinic, Child and Family, Tennessee, Inc. and West High School Foundation, and advises several other charitable foundations. Mr. Finn was recognized by his peers in a poll conducted by City View magazine in 2012 as one of the top Estate Planning/Trusts attorneys in Knoxville. Board Member, Interfaith Health Clinic, Child and Family, Tennessee, Inc.